Copyright © 2017 Raising Lemons, All rights Reserved. I tackled the organization of my game closet recently. It turns out it ain’t so bad to have a kid get his tonsils out. A lot can be accomplished with 3.75 ml of Lortab. Next, I wanted to get most of the games out of their boxes and into plastic drawers. Plastic drawers are much more durable than cardboard boxes (and look nicer too!) Many of the boxes were beat up and split at the corners. You can tape the corners but that only lasts so long as well. Plastic bins are a one time investment. Plastic bins make clean up easier. Some boxes only fit the games if you put the parts back in exactly the right way. It took almost as long to put Dominoes away as it did to play them because you had to stack the Dominoes perfectly in one by one into a column like box. With plastic drawers, all you do is put the drawer on the edge of the table and swipe the game pieces in. Easy peezy. Plastic drawers are all the same size and look neat and tidy in the closet. Board game boxes are all different sizes which makes them difficult to stack neatly and nicely. And the more you stack, the less stable the stacks are. And my favorite reason to convert to plastic drawers, is that drawers take less energy. They make random game pieces that you find lying around the house so much easier to put away. When you find that Jenga block or the Connect 4 chip under the bed, what are the chances you are going to walk downstairs, pull out the box on the bottom of an unstable pile, open the lid, put the game piece away and then close the lid just right, and then put the box back on top? Slim to none if you are me. And if you ask your child to do it for you, chances are a stack of games will fall out as he tries to remove the box from the bottom. But if you have all your games in a plastic drawer, the kids can just pull out the drawer and put the stray piece in. Again, easy peezy. Lastly, I labeled the drawers using Avery labels and a cute font. Now some of you might be saying, “But how do you fit the game boards in the plastic drawers?” And the answer is “You don’t.” (Sorry. It isn’t perfect, but it works. I promise.) I store the game boards to the side of the plastic bins along with any other big parts of the game that won’t fit in the drawer. I labeled those too so I would know at glance what game board it was. A few games took two drawers and sometimes I even put two games in one drawer. I left some games in their boxes for now, and for a few of the big, awkward ones I threw away their thrashed boxes and put them in a cloth bin at the bottom of the closet. Even though every game didn’t fit perfectly into a bin, the closet feels much cleaner and much more stable now. With most of my games tucked safely away in plastic drawers, next I tackled my game cards box. Many of the boxes had fallen out the bottom and I had taped them or I had thrown away the box. So I saw the idea on Pinterest to use a plastic soap dish to store cards. Well, I went to three different stores and couldn’t find any soap dishes that were big enough so I decided to come up with plan B.
I found these index card holders on Clearance in the School Supply section at Target last week. They had a few different color options. The index card holders would have to do instead. I was pleasantly surprised how well they worked. All of my game cards fit in great with some room to spare. I labeled them too and stored all the card games in a plastic tote. Lastly, I organized our puzzle collection. I put all the smaller puzzles in Ziploc bags with the Easy Zipper so my kids could get in and out, well, easily. Then I stored all the puzzles in a fabric bin at the bottom of the game closet. For my bigger, bulkier puzzles I opted to use the packaging that sheets come in. You know the kind that are 3D with the zipper. All of my puzzle boxes were split at the corners anyway, so I just cut out the front picture and put it in the front of the plastic package. I wanted Locke me to have a reference when we put the puzzle together. Now my game closet is all organized and ready to go for our Family Game Nights. I don’t want you to think that I cranked out all these projects on one dose of Lortab. It actually took me several doses and several weeks to get everything done and labeled and I still have a few loose ends to wrap up. But organization is doable over time and with baby steps. And it is worth it. Good Luck! It looks fantastic! Love the card holders. I read the whole thing!!! We bought a house that has absolutely NO game or linen closets! I still can’t figure out why the builder didn’t insist on putting some more closets in this house. Anywho…We finally put cabinets in the basement but the games and especially cards are a mess. I am going to buy new plastic drawers today and start organizing! I only have one baby so I want to start organizing now before we start collecting game for her too! Thank you for your awesome ideas! I read the whole post. I’m excited about this, I think it’s something I could tackle. Looks awesome! Love the index card holder find. Maybe some day I’ll actually have game closet! Was sold on the drawer idea when you explained the odd piece putting away thing (before that I was dubious!) Awesome post! Love, love, love it! We have many of those same games. What size drawers did you use? Corinne, I used the standard size drawers. They fit an 8 1/2 x 11 sheet of paper. The 12×12 size would definitely fit more of the games and probably even some of the game boards but they are more expensive so it is a trade off. Maybe a combination would work? I did use some boxier drawers for a few of the games that had more height. pinning this! Because I KNOW others will benefit from your Amazing Organization! Just found your blog tonight.. Wonderful post, I am doing a toy downgrade at my house and these ideas really help 🙂 The Lortab references crack me up by the way! Can a see a picture of where you have your game boards? you said you have them to the side, but I didn’t see them. Also where did you find all the bags (that are usually for sheets)? Love This! I especially like the way you used index card holders for card games. Storing these ideas away for when a tackle our game closet later this year. What size plastic tote did you use to put all the card games in? I am wanting to reorganize my game closet and liked some of your ideas. Thanks. It was a shoe box size. I love this idea and went to work right away. The only snag I’m having is that the kids have a tough time getting the drawers out on their own. You do need to tug a bit which sometimes leads to a jostling of the whole drawer system. Did you experience the same problem. Any tips on this? Other than that I’m so pleased to have an organized closet at last! Thanks for the idea! We discovered that when you pull the drawer all the way out, you need to lift up on it to release it from the catch that keeps it from falling out. The drawer does “catch” a bit on the way out as a safety precaution. But like Ginger said, you just have to lift or wiggle a smidge and it comes out. My older kids have figured it out fine, but I still have to take out the drawer for my youngest. I am okay with that though because then I know he can’t make a huge mess. Good luck! I hope this game closet organization works well for you. Read the whole post, and loving it! The stack of boxes, uneven and wobbly, are one of the things that bother me so much! Really love the drawers, I’m going to look for them (on sale) here. To bad we don’t have Target or the Containerstore here in The Netherlands… I read a lot of organizing tips from USA mom’s and see so many great things we don’t have here 🙁 I’m going to brows trough your blog now…. so, bye! 1. instead of putting ziploc bag puzzles in bin, i put a rod across lower portion of closet, picked up plastic baby hangers for pants (the kind w/clips) and hung them up. 2. i think i like your box idea better, but i used binders/pencil bags with 3 holes. put game board in pocket inside cover and pieces inside pencil bag that went on 3 rings. STILL not perfect though as many boards extend WAY higher than binder! but like you said, it wasn’t perfect but it looked a whole lot cleaner and replacing found pieces was so much easier. many binders had 2 games. name of games on spine. 3. we attached to door closet one of those handyman plastic small parts cabinets with large plastic drawers. we found that perfect for decks of cards and really small games and dice, marbles, game chips etc. 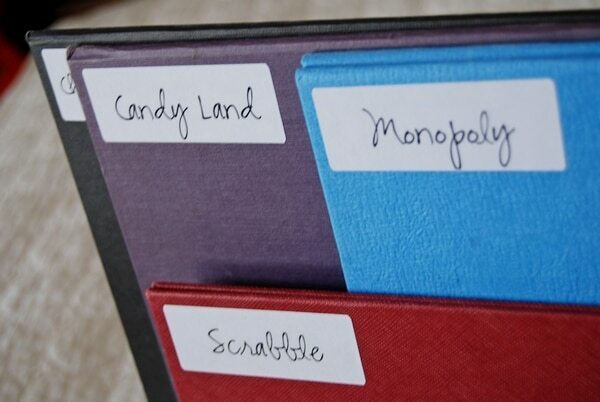 love love love the index card holder for decks of cards idea! Hi there! Wanted to thank you for posting this. I don’t usually leave comments on blogs but decided I should really let you know how much I appreciated your ideas. It was exactly what I needed and now in our new home, I can start fresh with this idea. Thank you very much! Which ones did you find that are completely removable? I have had a hard time finding more Sterilite brand ones that remove completely. We use them for puzzle pieces currently and we have another for pencils, markers & crayons. I’d love to find more but can’t! I’d like to know this, too!! I want to use your system, but tried all the Sterilite drawers in walmart and couldn’t get the drawers out despite wiggling and lifting them. Please help as I’m itchin’ to do this! Beth, mine are Sterilite too. I wonder if I just have an older model and the “latch” is kind of a new thing that they have added??? But I do have to slightly adjust and wiggle to get mine out. But it is nothing difficult. Maybe try an off brand and see if the drawers come out more easily, but are still durable. Good luck! I hope you get this figured out because it really is awesome. Not sure how much the drawers cost, but I was thinking that maybe I’d use 12×12 scrapbooking cases instead. They’re still clear plastic, would fit better in our bookcase and would fit all but 2 of our game boards. I’ve seen them on sale for $4 a case but I’m holding out for $3 a case as I guess they get marked down that much sometimes a couple times a year. As I need 17 cases, I’ll take any savings I can get. Thanks for the awesome ideas! I read the entire thing and it was AWESOOOOME!! I have all the same frustrations AND junky game slash coat closet!! On my way to Tar-jay!! Want to do this!! However, these drawers are too tall for my shelves. 🙁 My shelves are 11″ and unmovable. ideas? I love your game closet organization! I’m writing a game closet post for next week and I’m going to include a link to your post to give my readers some more great ideas. Sure, Anna. Glad I could help. I just stumbled across this post thanks to Buzzfeed (http://www.buzzfeed.com/peggy/how-to-de-clutter-your-entire-life). THIS is my 2nd favorite pin. Coffee cake comes in at #1… but with a slice of coffee cake in hand I am SO tackling our game closet. Thank you! It looks really neat, but i would’ve cried a LOT if mom had done this when I was smaller. I really like the original boxes, I know they get a little distroyed, but i love the original ones *-* I took great care of my games, the only thing that was in bins was my brothers Lego pices. Thank you, found you through Pinterest and this is the answer to my overloaded game closet. I didn’t find any available online, Katie, so I just posted a note on Facebook and a few friends had some for me. Since then, I now keep the plastic zip containers when I get some because they are really handy. I used several recently when I moved. I too would LOVE to know — what font you used for the labels?? –it’s darling! I found zippered vinyl storage bags in varying dimensions on amazon.com! To Clear or Not To Clear? Copyright ©2016, Raising Lemons. All Rights Reserved.